As the Chicago Reader's Mick Dumke and Ben Joravsky reported on recently, private operators of public services seem to be erring on the side of privacy rather than transparency. A private sector instinct for the shielding of information seems to be pervasive among these operators, particularly schools. The systematic privatization of public services assumes that accountability and efficiency will improve because private firms are more sensitive to consumer response. This is a particularly common rationale for the privatization of the school system. As private operators move in, the argument goes, they will be more accountable to parents out of fear that the parents-as-consumers will take their "business" (e.g., children) elsewhere. Since "an education" is a service and not a good and its effects are rarely immediately evident, parents as consumers would have to rely on information from the school to provide the cherished "market signals" to which private operators would respond. So a major school operator in a huge education "market" being intentionally opaque would be a cause for concern. The Freedom of Information Act [PDF] (5 ILCS 140/) is meant to give the public access and insight to the operations of government. For large bureaucracies, this often means asking them to put information together in a usable way. They are not always required to do this, of course, because if the law required government bodies to interpret and synthesize data for the public, the workload would be prohibitive. Still, if the request is reasonable, particularly if it is a request by a person or an organization with a clear public interest, the government generally tries to meet your request. So, for example, if you send a FOIA request to the Department Housing and Economic Development, as I did recently, and ask for a spreadsheet that lists all the payments made by specific TIF districts, they will generally comply specifically to what you're asking. Obviously they keep that information somewhere, and the precise name of the document or file where they keep that data isn't necessarily going to be known to a member of the public. What they could do, because of the literal language of the statute, is tell you that you're screwed unless you know the specific name of the "record" where they keep that information. And supposing they then tell you the name of that record, they could then send you a mountain of invoices, which they can charge you for copying. They wouldn't need to do this--it would go against the spirit of the law, not to mention not be all that necessary to save time. Take another real life example: the United Neighborhoods Organization - Charter School Networ, or UNO. UNO is run by Mayor Emanuel's sidekick Juan Rangel and a once lefty activist named Phil Mullins. Once a community organization, it is now a highly connected corporation that eschews organizing for access and patronage, and is a critical arm of the Machine Lite inherited by Mayor Emanuel from his predecessor. UNO is also one of the largest operators of charter schools in Chicago, expertly wielding its political clout to raise the cap on charter schools and increase funding to charters. In this example, we have the advantage of a side-by-side comparison. An experiment of sorts. 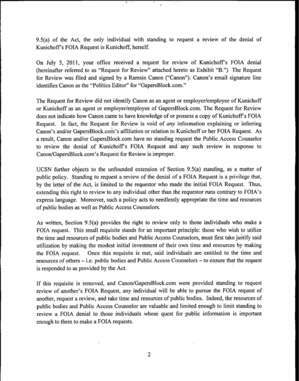 I, along with GB contributor Yana Kunichoff, submitted mirror FOIA requests to the Chicago Public Schools and to UNO. From the CPS, the information we wanted was: the zip codes of terminated teachers, their levels of education, teaching specialties, and their demographic information (age, race, gender). CPS' FOIA officer called me and told me the request couldn't be filled in full because of privacy concerns. I replied with some case law that suggested that privacy would not be unduly violated. Eventually, our request was filled without some of the information we wanted, but a fair compromise. What we requested from UNO was the mirror image: the number of teachers hired between 2004 and 2011, and the educational attainment and geographic and demographic information of the teachers they were hiring. 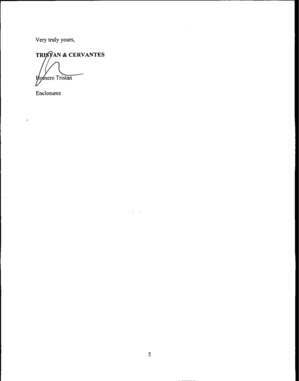 UNO did not bother to call me--instead, their law firm, run by one Homero Tristan, sent us a short letter informing us that they would not fulfill our request because what we wanted was not a "record" but data. We appealed to the attorney general's office, who deemed our appeal worthy of further review. UNO responded with a letter* to the attorney general spelling out in exhaustive detail why they would not fulfill our request. 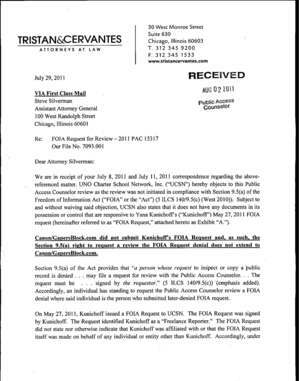 First, they hit on a technical point: while Ms. Kunichoff filed the original FOIA, I filed the appeal--something I pointed out to the contact person at the attorney general's office, and which we cleared up over the phone. Second, they argued that the number of teachers was not "a record" in the literal sense, but data. Last, they argued that the information about the teachers was not "a document" and so not subject to the Freedom of Information Act. Unlike Dumke and Joravsky's request, we were not asking UNO for potentially embarrassing information--salaries and spending. We very purposefully were asking for information of critical interest to parents--"consumers" of education services. Who is the school system hiring to educate kids? Do they live in the community? What degrees do they hold, and do their jobs at the schools match what they studied? What's the average age of new hires, indicative of their experience? These seem like precisely the things a parent would want to know about a school to which they are about to send their kids. Octavio Paz was the first UNO charter school to open in 1998. The schools serves the community of Little Village. For the 2010 - 2011 school year, 434 students are enrolled in the school's K-8 programs. This scant information is now coupled with evidence that the school will go to some lengths not to provide information about its operations to members of the public, including using attorneys to pick out picayune trivialities to deny a request--the fact that Ms. Kunichoff filed the original and I filed the appeal. 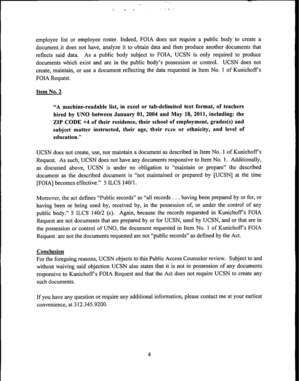 Suppose a mother files a FOIA and her husband files an appeal--would UNO behave the same way? All of this back-and-forth and appealing and researching previous cases and tailoring FOIA requests was done by journalists with experience--but more importantly, people with time to go through the process. It seems unlikely that individual parents would have the time and knowledge to pursue information as vigorously. And parent groups--or independent third parties looking to provide this information to parents as a service--would be unlikely to fair any better. However, [an attorney general spokesperson] recommends that we all forge ahead. "Charter schools are subject to FOIA," Bauer e-mailed us. "We encourage you to file with [the attorney general's office] if you are still having difficulty getting schools to comply." Things got even more interesting last week, when we called Chris Mather, a spokeswoman for Emanuel, to ask whether the mayor intended to make UNO and the other charters obey his transparency requirements. Mather didn't respond. But soon after, Tristan called to say that UNO had reconsidered and would send us the information we'd requested--two and a half months earlier. Our engagement with UNO took place before this exchange, though the fact that UNO may have needed mayoral intervention to act--as the Reader piece seems to indicate--is hardly encouraging. The presumption of opacity--and the use of taxpayer funds to pay Homero Tristan to preserve opacity--is diametrically opposed to the spirit of FOIA and the already controversial purpose of school privatization. The use of the term "market" is key here. These edupreneurs are treating this like a business and a covert one too. Interesting to note that the Board of Ed. and tax paying dollars still also go to these schools. In other words, in some ways this is a partnership of public and private funds with still less accountability.